Bourse Analyser is our advanced trading solution starting from $70 (including GST) per month that integrates the best of Dion Global’s TradeCentre with our analytic & charting tools. At the core of Bourse Analyser is Dion Global’s TradeCentre, the latest upgrade to the Dion Global’s TradeCentre, and an industry leader in market data and online trading systems. With real time, dynamic data and direct market access, Bourse Analyser is designed for active day traders and professional investors. View dynamically updating live market depth, watchlists, course of sales, detailed security information, company news, ASX Market data, company information and more. The comprehensive array of data views gives you the full picture on the price movements and market trends affecting your portfolio. Online Trading, Order Management Create, monitor and modify your orders in real time market forces. The ability to set alerts and contingent orders to quickly take profits when the opportunity pops up. Bourse Trade Tools. This is a unique extension to the Bourse Analyser which gives you a powerful set of tools for finding trade opportunities. 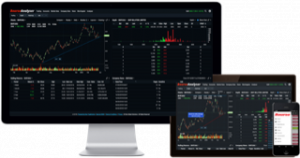 The Bourse Trade Tools includes an advanced charting engine with a broad array of technical indicators and signals, as well as a market scanning tool for you to build and searching out stocks matching your criteria. Find out more about Bourse Trade Tools. Comprehensive ASX Market Data & Company Information View live market depth, watchlists, course of sales, detailed security information, company news and more.The comprehensive array of data views gives you the full picture on the price movements and market trends affecting your portfolio. Online Trading & Order Management Create, monitor and modify your orders in response to real time market forces, and set alerts and contingent orders to quickly take profits when the opportunity pops up. If you already have an account with Sequoia Direct, call us to get Bourse Analyser access enabled. Please visit our Price page for platform fees, live ASX data charges and information on frequent trader discounts.